Pros: Phenomenal design and a stand-out leading performance. Cons: Intellectually demanding and a bit lengthy. Another top-quality production from one of the best off-West End venues. 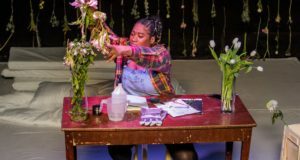 The Finborough is one venue that never fails to deliver, and their current production (and the World Première in English) of Sommer 14: A Dance of Death is another on a long list of memorable and impressive shows to grace their intimate and versatile space. 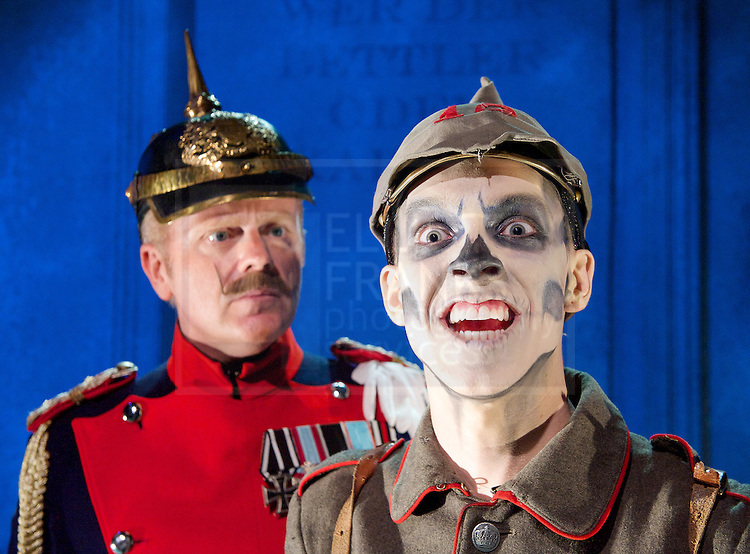 I will say that Sommer 14, an epic of the First World War written by Rolf Hochhuth, is a departure from the organic and personal productions I have seen previously at the Finborough. Sommer 14 boasts a cast of twelve, and is positively Brechtian in style, presenting a montage of scenes leading up to Germany’s declaration of war in 1914. We travel through critical moments and shadow vital players in the lead-up to WWI alongside Death who, outraged and disgusted by human disregard for mass killings in war, takes human form to investigate how WWI was ignited. It’s a tough script, jumping from country to country, character to character, leaving little time to invest in the myriad storylines. It mixes multimedia and song, and is peppered with dark humour, creating an alienating and occasionally jarring experience. Although with such obvious influences from the inventor of epic theatre, Bertolt Brecht, this is likely the intention. As Death, Dean Bray is a captivating tour guide through the piece; serving as the one constant element throughout, he shines in the demanding leading role. 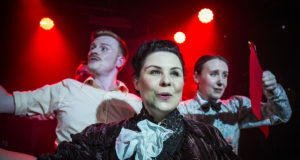 He is well supported by the cast – Sarah-Jayne Butler gives a particularly riveting and haunting performance as a victim of the sunken Lusitania, and Nick Danan was a joy to watch in his various roles. I did miss the intimate and raw performances I have come to associate with productions at the Finborough; Sommer 14’s unique style left less room for the actors to showcase their talent, though they’re certainly not to blame for the less accessible (yet still impressive) script. The show’s biggest strength is its conceptualisation and design. I’m always amazed by the Finborough’s distinct ability to make me feel as if I’ve never been there before. Granted, this time around the feeling might have been intensified since I’d been away so long, and also had my first sight of the refurbished bar (offering a great selection and plenty of cozy places to sit indoors). Still, the wonder at the theatre’s versatility and commitment to creating the unique atmosphere of each production is an experience not particular to my long-awaited return, and all credit is due to the Finborough’s consistently high standard when it comes to the elements of design. The technical elements of Sommer 14 are simple, but stunning and professional. Though the play spans all of Europe, the set is basic: a dilapidated interior that looks, with its crowning and engravings on the walls, to have once been grand. Each scene easily recreates itself from the last; the movements from Paris to Vienna to Berlin and Sarajevo, are made with ease, but none-the-less believable, thanks to shifts in light and sound. Costuming was impeccable and impressive considering the large cast playing multiple roles. Perhaps most striking as far as design was Bray’s make up as Death. He opens the show pale with gray shadows highlighting his cheeks and a gruesome gun wound to the head, and with each scene, he grows whiter while the shadows darken and spread until his face has unmistakably become a skull. The changes are subtle – occurring slowly over the play’s two-and-a-quarter hour run, and by the end the change is shocking but effective. 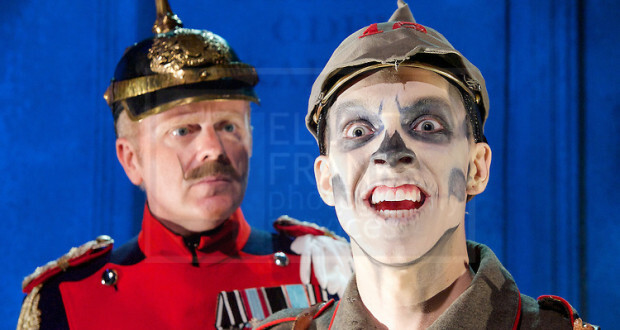 Without doubt, it’s another excellent work from the Finborough, and if you’re up to put your thinking cap on, or, like this reviewer, wrote your dissertation on Brecht, you won’t want to miss this modern homage to an influential writer and memorial to those lost in WWI.